Forest officials and experts have expressed serious concern over illegal and unchecked harvesting of weni wel, Sri Lanka’s age-old multi-cure herb, by racketeers and profiteers driven by the high demand for it. �Recently, forest officers in Thawalama arrested four people who were transporting without a permit some 700 kg of weni wel. Thawalama forest officer Sunil Kaluthotage said the suspects pleaded guilty when they were produced before a magistrate. Prematurely harvested weni wel stems being dried. The case was the latest addition to the series of detections made in the area. �Mr. Kaluthotage said that during the past 12 months, at least six illegal ‘weni wel’ cases were reported from his range alone and this showed that haphazard harvesting was on the rise to meet the demand for weni wel in the market.�Locally known as weni wel, weniwelgata or ban wel, the plant has Ayurvedic medicinal properties. Described as the Ayurvedic equivalent of paracetamol, weni wel is a much sought after herbal cure for ailments ranging from common flu to tetanus. It is a key ingredient in the famous Pas Panguwa. Known as ‘False Calumba’ in English and coscinium fenestratum scientifically, weni wel is a woody climber commonly found in Sri Lanka’s lowland wet forests such as Sinharaja and Kanneliya. 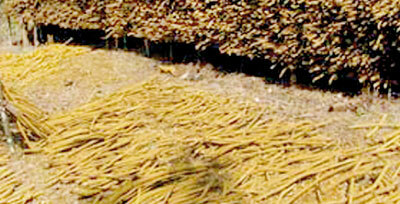 The plant is also native to South India, Cambodia and West Malaysia. �But unchecked harvesting of weni wel, which takes decades to reach maturity, has raised alarm among experts. They say that some plants take 30 years to mature to the level which gives it a ‘geta’ or knotty appearance – a sign that indicates that it was of best quality. The herb is also used in a range of commercial products including soap, creating a big demand for it. �Prof. Nimal Gunatilleke, an expert on forests, said he believed that the demand for it in the market had led to unchecked and premature harvesting of weni wel.�“While we can be happy that a traditional herbal product has found new and emerging markets both locally and overseas, can the resource base cope with the current and projected demand?” he asked, stressing the need for a thorough research to find the right balance. “As biology researchers of both timber and non-timber forest products, we realised this need several decades ago. We have been studying the weni wel’s biology and ecology as well as its propagation and cultivation in a number of habitats with a view to reducing the extractive pressure on the wild populations,” he said. Prof. Nimal Gunatilleke warned that if this current level of extraction was permitted, weni wel would soon, if not already, be on the list of threatened plants of Sri Lanka. 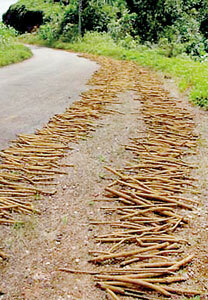 The eminent botany professor said he had seen large stocks of dried weni wel stems along the Kukule-Molkawa road, ready for transport. He said the people had told him that they had paid for their permits to harvest them. Prof. Gunatilleke said that since weni wel grew better in partial light and was commonly found in degraded forests and forest edges, the plant could be grown in pine forests in the wet zone and in home gardens. He said the weni-wel plants that were planted at the edge of Sinharaja on experimental basis reached harvestable level within 15 years or so with no fertiliser added, though the quality would have been better if the harvest had been done much later. The professor welcomed a recent suggestion by Economic Development Minister Basil Rajapaksa to set up a forest in every village.�“This concept of ‘one forest for one village’ would be an excellent proposition in managing local ecosystems while providing benefit to the local people. At the same time, it would also be worthwhile to consider how the existing pine plantations could be converted into forests of native plants, both timber and non-timber species,” he said adding that this would help enhance biological diversity and ensure environmental security. “On our part, we have shown that this could be done in the lowland wet zone using suites of such species of ecological and rural economic importance in Sinharaja and Hantana demonstration plots. More such studies are needed, if we are to conserve and utilise our rich biological heritage, bringing in tangible benefit to the local communities,” Prof. Gunatilleke said.